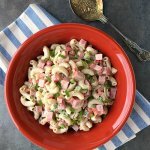 This easy Pasta Salad has a light, slightly tangy and delicious dressing instead of the usual mayo-heavy one. A refreshing dish for the hot Summer months! It’s no secret that I’m a fan of pasta salads. 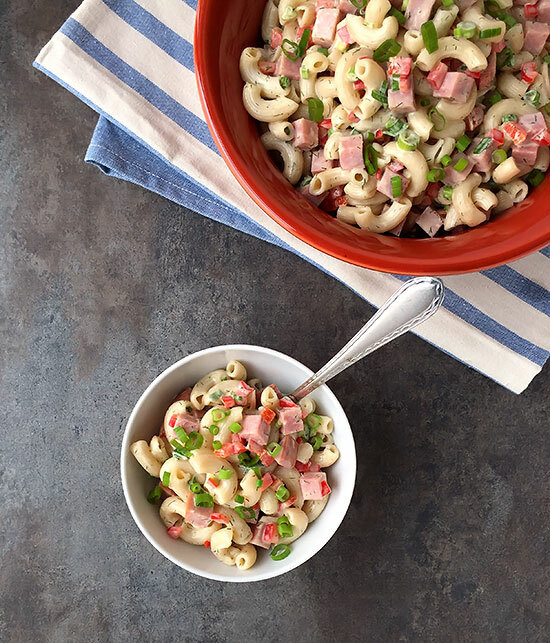 I’ve already shared recipes for Chicken Macaroni Salad and Macaroni Tuna Salad. 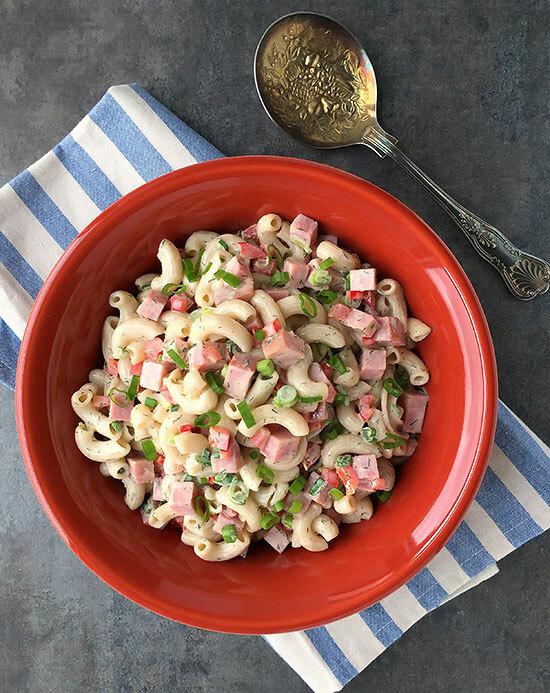 This new pasta salad recipe features ham and a light, creamy dill dressing that is very tasty. I used a Niman Ranch brand of ham steak for my pasta salad. The gluten-free brown rice pasta I used is from Tinkyada. It holds up really well in dishes like this one and doesn’t get all mushy when cooked correctly. The light dressing is what makes it such a great Summertime pasta salad. Most pasta salad dressings are very heavy on the mayo. The dressing is mayo-based, but I keep it light by using a mixture of extra virgin olive oil, vinegar, mayo and dijon mustard. It gets a touch of sweetness from a little honey, and the dill adds a ton of extra flavor that pairs so well the rest of the ingredients. I used dried dill in my recipe, but you could certainly use some fresh if you have it. This easy Pasta Salad will serve four as a main course or up to six as a side dish. In a large pot, bring 4 quarts of water to a boil. Add sea salt and pasta, and let cook, stirring often, until just tender. Drain the pasta, and rinse with cold water until it's cool, then drain shortly. You want the pasta to still be slightly wet so that the pasta doesn't absorb too much dressing. Place it into a large bowl. In a small bowl, mix together the mayo, olive oil, vinegar, dijon mustard, honey, dill weed, and sea salt. Add the dressing, ham and vegetables to the pasta, gently mix to combine, then serve. If you have leftovers, you may need to add a little warm water to loosen the mixture back up before serving. Gluten-free pastas vary widely in their cook time. Use the cook times on packages as a guide, but start checking a few minutes before that time. My recipe was tested with Tinkyada brown rice macaroni.